We had the most amazing time visiting the beautiful city of Vienna, Austria! On our travels we attended many museums including the Belevdere Palace to see the master works of my favorite artist Gustav Klimt. The reception for Keeping You Inside, by Heather Shirin - was Friday October 3rd from 7-10pm at Delurk Gallery. The opening was so much fun! We had a great turn out for the opening of the show. The crowd included a reporter from Yes! Weekly magazine and the article will be coming out this week. The night ended with a band setting up and the lights dimming to a very young and hip crowd ready to rock the gallery into the wee hours of the morning. Winston-Salem was also an interesting town to shop and investigate. We enjoyed dining at the Foothills Brewpub downtown, and shopping in the Arts District. My current series focuses on portraits of women, featured in a quiet and reflective way. I am exploring relationships that women have with other women - the closeness between sisters, mothers, lovers and best friends. I capture the vulnerability, strength and romance that women share when together - using materials that define their beauty and presence. Women Painting Women show at the J. Cacciola Gallery in NY. "Art history is rife with female imagery, almost all of it painted by men. The masculine idealization of women, often referred to as the “Male Gaze,” has been a staple of art historical debate for decades now, with no resolution in sight. After all, the fact that a male artist, Titian, painted the “Venus of Urbino,” or the very macho Picasso painted abstractions of his lover Dora Maar neither adds nor subtracts from the paintings’ aesthetic qualities as masterpieces. But though the “Male Gaze” may incorporate the highest qualities of art, it does call into question the definition of womanhood. With rare exception (Artemesia Gentileschi, Mary Cassatt, Berthe Morisot, Marie Laurencin among the notable few), women’s definition of themselves is nearly absent from the history of art. It is only recently that artwork by women has been taken seriously by the art establishment, and indeed is still woefully underrepresented in major collections and galleries. J. Cacciola Gallery’s exhibition WOMEN PAINITNG WOMEN: Shelley Adler, Edwige Fouvry, and Kim Frohsin is part of the contemporary push to serve as a corrective to that imbalance, in this case through figurative imagery. The works by Fouvry, Frohsin and Adler present us with three distinct views of female experience, but the exhibition is not an implicitly political one; it is first and foremost an aesthetic one, presenting the work of three brilliant contemporary practitioners of art’s most traditional medium, painting." When I read this opening paragraph, I knew it touched a place of motivational and inspirational power inside me. I too, paint women as a woman. It had never been put so blunty before me - that in Art History, men were the painters, not women. Women today don't seem to be phased by our history, since it's not OUR own personal history or experience. We choose to see the open playing field of opportunity in a world who cries to be equal. Finally as a Painter, not just a woman, I want to express my gratitude towards the J. Cacciola Gallery in support of reconizing all forms of women's advancement, esp. reconizing the field of Women Painting Pomen. It warms my heart that this subject is getting the attention it deserves. 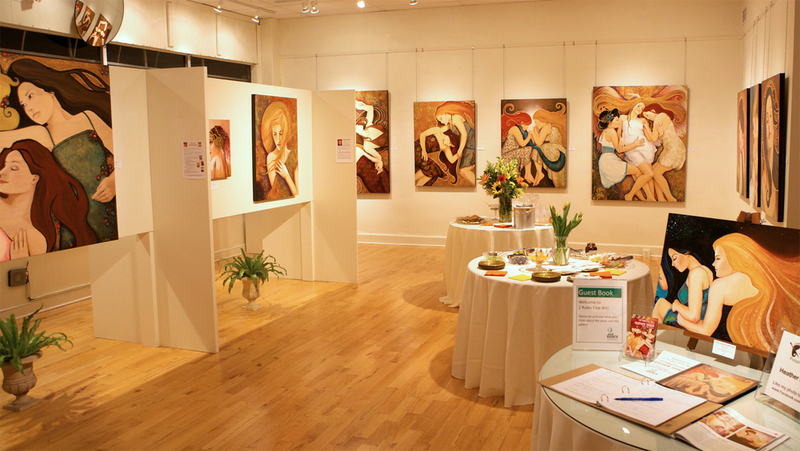 Please attend their show, Women Painting Women September 4 - 27, 2014 Opening Reception: Thursday, September 11, 2014 6pm-8pm. More information on their website. Opening Reception for "the Unwritten Lyrics" a solo show for Heather Shirin, an Art Nouveau Figurative Portrait painter in Marietta GA at 2 Rules Fine Art Gallery. The show was well attended during the first art walk of the year - guests came from all around Atlanta to see the works and to meet Heather. The Unwritten Lyrics, a solo exhibition of paintings by Heather Shirin, will open at 2 Rules Fine Art in Marietta on April 4. MARIETTA (February 25, 2014) – 2 Rules Fine Art presents The Unwritten Lyrics, an exhibition of mixed media paintings by Asheville NC artist Heather Shirin. The show will run April 4 through May 30, with an opening reception on Friday, April 4th, from 6-9pm. An additional reception will be held on Friday, May 2nd, 6-9pm. 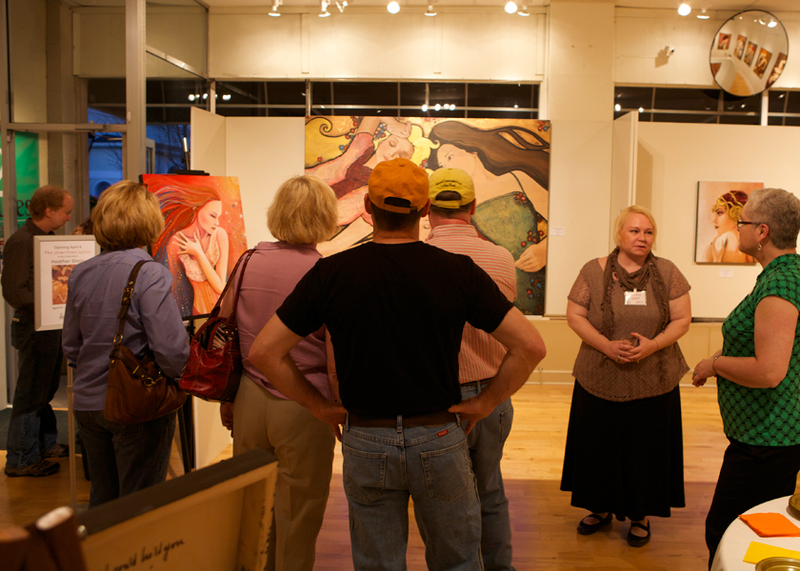 Both receptions take place during Marietta’s First Friday Art Walks. Shirin’s paintings are quiet and reflective portraits of women with other women. The mixed media portraits, mostly large-scale, are painted on deep birch wood panels. Shirin purposely allows the natural beauty of the wood grain to shine through in the skin tones of her female figures. Various fine art papers are used to depict clothing, and elements such as gold leaf and metallic paint give the pieces a highly reflective appearance. Intricate designs add texture and depth to the works, creating modern portraits in a style that is reminiscent of Art Nouveau period pieces. The receptions on April 4 and May 2 are free and open to the public. The Unwritten Lyrics will show at the gallery through May 30. The gallery is located at 85 Church St., Marietta GA 30060. Visit http://www.2rulesfineart.com/shirin.php for more information about the exhibition or call 404-355-6897. Founded in 2011, 2 Rules Fine Art is an Atlanta-area art gallery showing “Art You Need to Know About.” The gallery presents art by local and national artists, with an emphasis on art that is innovative in technique, presentation, or design. 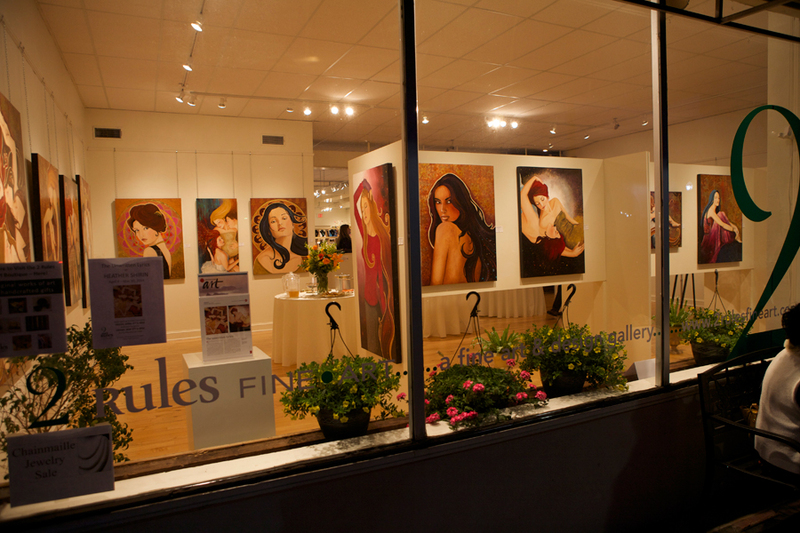 2 Rules Fine Art is located at 85 Church Street, Marietta, GA 30060. 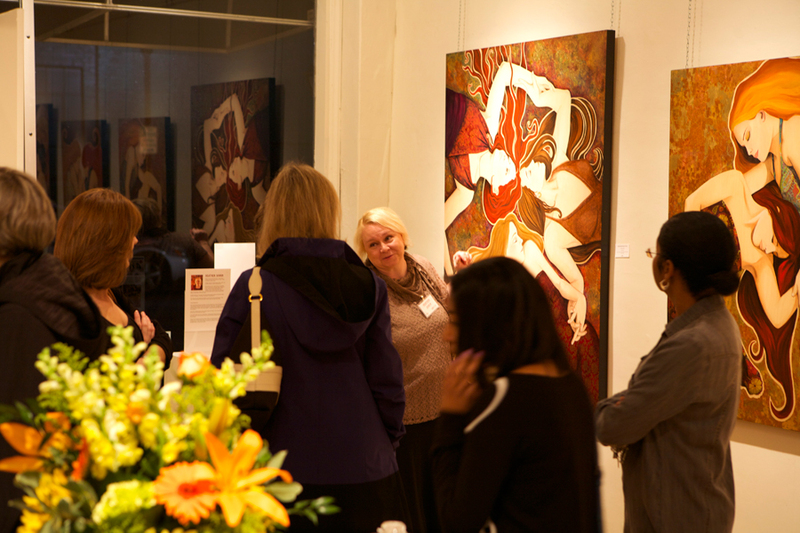 For gallery hours and other information, visit http://www.2rulesfineart.com or call 404-355-6897. Heather Shirin was born in Minneapolis, MN, and she currently resides outside of Asheville, NC. She earned her B.F.A. with honors in oil painting in 1997 from the University of Massachusetts, Amherst. She went on to take additional design courses from the Museum School of Fine Arts, Boston. She teaches Art Nouveau Portraiture & Mixed Media Classes at the River’s Edge and 301 Art Gallery, in the River Arts District in Asheville NC. She is also an active volunteer at the Asheville Area Arts Council and the Artery Gallery. She is a juried member of the National Association of Women Artists.